Since I ran the Boston Marathon in April 2017 I have been at a bit of a loose end. I didn’t know what to do with myself. Come September I started swimming lessons. As if running and swimming was less, one day, a road bike, along with the trainer showed up at home. I really didn’t have a choice but to start cycling, as well. How I have cursed Pulin (our inspiration for this Tri- a 70.3IM finisher) for this! I have no room left in my room to walk around, with the piano on one side and the bike on the other! 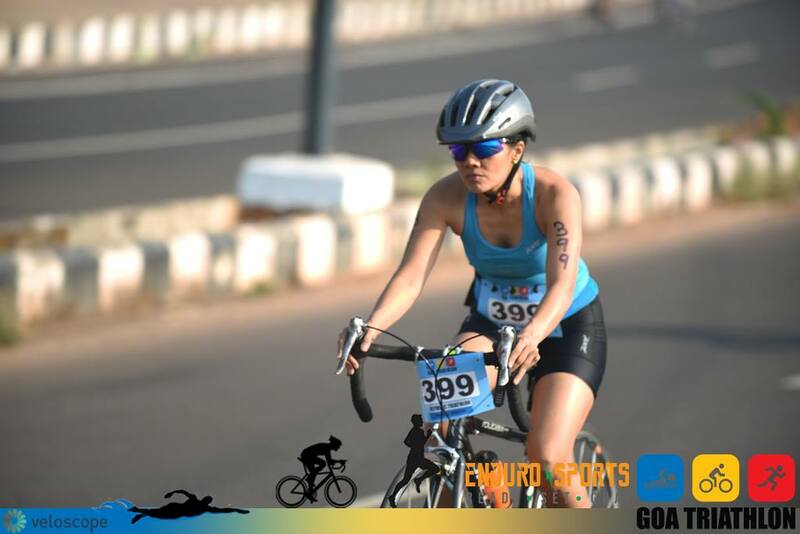 Q: What was I thinking when I signed up for the Enduro Sports goa Olympic Tri!!!??? 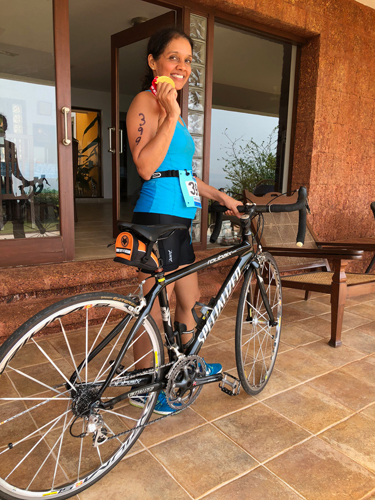 Life became a constant juggling act between training for TMM full marathon, in January 2018, and this Goa tri only 3 weeks after. As a strategy, I kept the mileage going with thrice a week running and the long run on Sunday sacrosanct, as was the swim drill session on Monday mornings. It was crazy. I tell you…there were many days when I wondered…why am I doing this to myself. None of it was easy. I couldn’t keep up with the boys on the long runs, due to lack of speed work, and in the Monday sessions I trailed behind the champion swimmers as they had been swimming for over 2-3 years now and I was just about making it across the pool. As regards the bike, at first I struggled to keep my balance, and once I started biking for over an hour, a new point would start paining in my back/shoulder/neck after an hour of biking. And then, in a flash, the Race weekend was upon us! We jumped into the ocean to acclimatise. The water was cold but calm. Comforting. 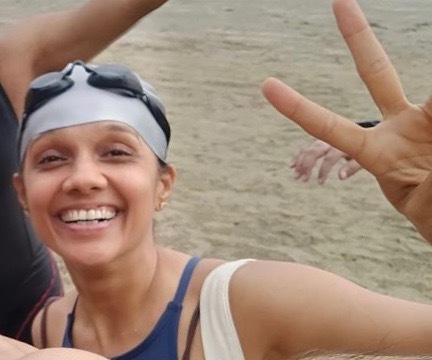 We swam inwards, with a whole lot of triathletes, newbies like me as well as serious racers. After 30 mins I felt I could do this not panic. 40km Bike on rolling hills. Bambolim Beach resort: At the expo. Such a wonderful atmosphere. Like a family they said, and that’s exactly how it was. It felt safe. Seeing the legends Lucia and Pablo was a thrill. I had heard so much about them. I couldn’t wait for the race to begin! We checked in our T1/T2 bags, racked our bags and were all set. It was so well organised, with friendly, smiling volunteers. Got my number tattooed and felt like a real triathlete! All we had to do now was jump into the cold ocean! Ok…seriously… What was I thinking!!! I swam well, even if I say so myself. The key was to remain calm and keep my breathing under control. I managed that and got out of the water like I had won the war. Challenge 1 done!! I was thrilled to bits. The wonderful volunteers awaiting us at the beach were encouraging us to run through Transition 1 to the bike, but I just had to spend a few seconds doing a little victory dance on the sand, take a few deep breaths find my balance before I moved into the next part. This was never ending. No time to rest. There was a 800m climb right in the second Km, which I biked half and walked the rest. I had picked my battles. In the first loop, as I flew down the highway, I felt wonderful. This is what I had come to Goa for. To enjoy this Triathlon. And I was feeling on top of the world. Seeing the world athelets zip past me was a thrill! Oh, they were a blur! By loop 3, I saw the others already running. And I thought to myself, when will this end? It was a great experience as everything was happening in that 12km loop, so we kept spotting each other as we biked and ran. Passed point B for the seventh time, and zoomed into T2. I need to rest. Stop. Sit. But no! No chance of that! Go, go, go said the volunteers! With gingerly legs, I strolled out and slowly picked up. Pace came surprisingly easily and for the first time in the race I relaxed. Shook out my shoulders and smiled. Only 9k to go! Great! I will be done soon. I ran easy, encouraged the walkers, just ran with rhythm, slow on the uphills and flew on the downs. I was in my comfort zone. And before I knew it, 2k to go, and that treacherous 800m bike uphill, became my fastest 800m downhill sprint. And then I saw the board…” Smile, only 500m to go”. And that did the trick. I pumped my arms up the last hill, flying past 2 triathletes along the way to blaze up to the finish. 3 push ups later, hugs, smiles and gratitude! What a wonderful feeling.